The Skinny: A middle-aged Japanese farmer finds himself stranded in Manila in this unconventional, highly involving tale of life, love, and second chances. Review by Calvin McMillin: Want to see an honest-to-goodness romance, but you're tired of formulaic tearjerkers and trite romantic comedies? The curiously named Love Tomato might just be the solution. With its unconventional casting, cross-cultural setting, and subtle social commentary, Hideo Nanbu's 2007 film is like a breath of fresh air in a genre that has grown increasingly stale. Curiously, the plot begins with a setup straight out of a romantic comedy. 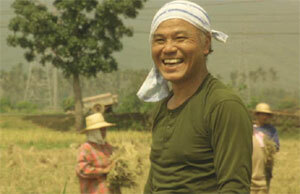 Although a decent, hardworking farmer, Masao Noda (Yasuo Daichi) has been fairly unlucky in love. Now in his fifties, he has yet to find a wife and is still living with his parents. With his mom and dad getting older and the farm soon to be his sole responsibility, Masao is in definite need of a companion. Unfortunately, nobody seems to want to marry a farmer. Even if they find the rural life charming at first, city girls eventually balk at the idea. And although they may seem like ideal partners, farmer's daughters don't want to repeat the lives of their mothers. With the help of a matchmaking service that brings city women to Masao's farming community, our hapless protagonist hits things off with Keiko (Yasuko Tomita). But his luck runs out when his sweet date goes horribly, horribly wrong thanks to Masao's comical over-eagerness. Although she assures him to the contrary, Keiko eventually bristles at the thought of being a farmer's wife and backs out of their potential nuptials. Eventually, Masao bounces back and meets Liberty (Ruby Moreno), a Japanese-speaking Filipina who seemingly has no qualms about being a farmer's wife. In short order, the two decide to marry, and Masao accompanies his fiancée to Manila to meet her parents. Withdrawing loads of money for Ruby's dowry, Masao visits her parents, hands over his money, and gets their blessing. Everything seems to be going right in Masao's world. Emphasis on the word "seems." And here is where the film's tone changes dramatically, as Masao's life gets turned upside down in horribly dramatic fashion. Now penniless and stranded in the Philippines, Masao finds himself wandering the streets, eventually becoming a beggar. The film jumps ahead some time later, and we find Masao in a very different position. Now a slick, street-smart mover-and-shaker, Masao spends his days working for an unscrupulous Japanese agency. His job? He recruits young women (some merely teenagers) to become "entertainers" in Japan, although it's clear that they're destined for nothing more than prostitution. But it's the only job Masao can get, and it's making him enough money to return to Japan with some dignity. As the agency's most successful recruiter, Masao seems well on his way to achieving his goal. However, Masao's life changes in a way he never expects when he meets Christina (Alice Dixson), a worker at a hotel where he does business. Coincidentally, he meets her again outside the context of the hotel and discovers something unexpected about her background. Christina herself is farmer's daughter. While admiring a group of people working in a pasture, Masao spies Christina. He soon discovers that she's helping her family with the harvest as her father is laid-up in the hospital. This chance encounter not only awakens a love for farming that Masao had actively rejected, but also his chances at forging a real relationship with a woman. Masao immediately decides to help Christina, learning more about her family, the plight of Filipino farmers, and his own wants and needs. But even as a chance for love blooms with Christina, what happens when she finds out about his job? Would she still want to be his wife? And considering how close she is to her family, would she even want to move to Japan? Character actor Yasuo Daichi served as writer, producer, and leading man for Love Tomato, an old-fashioned romance that is involving from the very first frame and never feels contrived or manipulative. Most films I've reviewed for LoveHKFilm.com deal with characters no older than forty or people who act like they're still in their twenties no matter what age they are, so it's refreshing to see a film that deals with the experiences of older characters. But such a premise is only as good as the actors involved, and lead actor Yasuo Daichi delivers a wonderful performance. Acting predominantly in English, Daichi is able to convey a sense of genuineness and poignancy in a language that is clearly not his first. Surprisingly, it is the more versed Filipino actors who come across a bit stiff in their English line readings. Even so, Alice Dixson is a sweet and warm presence, making her unlikely relationship with Yasuo more believable than their obvious age difference would initially lead you to believe.